For the best customer results with your video skill, you can provide your content catalog to Alexa. This catalog contains your media and descriptions of the media in a common XML format. Once submitted, the catalog is integrated with Alexa's content, speech and entity models, and we use your catalog data such as information about actors, shows, seasons to train Alexa. When you provide your media catalog to Alexa, customers benefit from the increased content knowledge. When a customer asks Alexa something, Alexa performs natural language processing (NLP) on the request. As a part of that processing, entity resolution (ER) may occur, meaning Alexa identifies parts of the spoken request and resolves it against a list of known information. For example, if a customer asks for "movies with Billy Bob Thornton", if Alexa understands that Billy Bob Thornton is an actor, it helps Alexa understand that the customer is asking about video content. If we know a specific provider has video content with Billy Bob Thornton, it helps us resolve the request to that provider. In addition to the natural language understanding, the ingested catalog content is used to help train automated speech-recognition (ASR) models to translate spoken word into the correct text, particularly for more challenging linguistic translations such as principal and principle, which are homophones. Improved accuracy: Speech recognition accuracy is improved, which improves the customer experience. Versioning support: You can easily roll back to a previous version if needed. If you don't provide your content catalog, Alexa will use a generic catalog made up of Gracenote data. Gracenote data is available for English (UK), English (US), and German skills. There are a few steps to provide your content catalog to Alexa. Format your content in the catalog data file (CDF) format. This is the same format used by Fire TV. For more information, see About the Catalog Data Format. For validation, use the CDF schema (XSD) file. 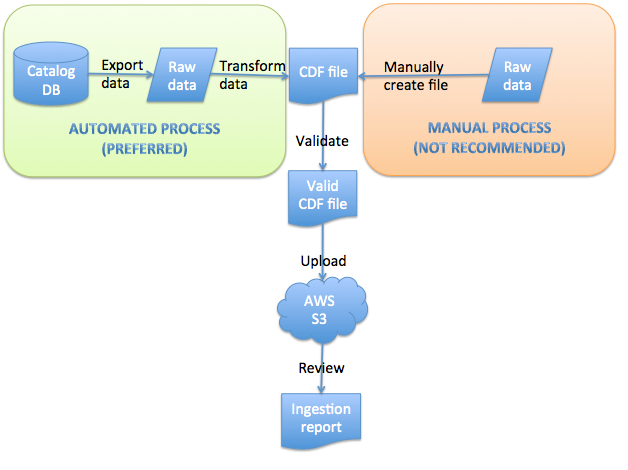 Upload the CDF data to an assigned AWS S3 bucket. For more information, see Uploading your CDF File to AWS S3 in the Fire TV documentation. Alexa imports the data into the catalog and generates a report indicating success or failure. For detailed instruction on the CDF format and how to provide your content catalog, see Integrating your Catalog with Fire TV.